The archaeological ruins known as Piedras Negras are located on the eastern bank of the Usumacinta River, just inside the border with Mexico in northwestern Guatemala. The site was one of the largest and most important of the Classic Maya period. It is remarkable for its many magnificent limestone sculptures, relief panels, and stelae. 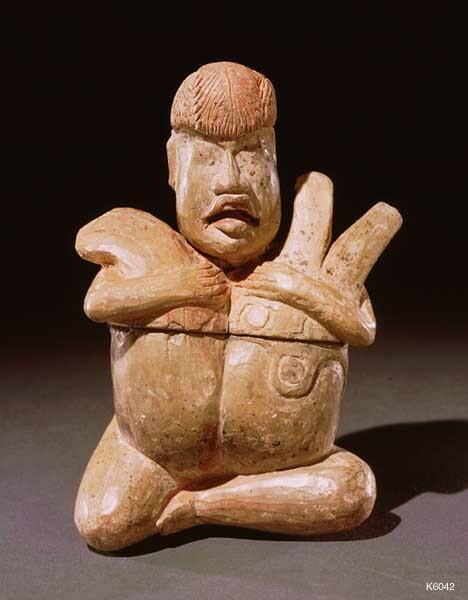 The selection of Piedras Negras as the University of Pennsylvania Museum's first long-term project in southern Mesoamerica was based on a recommendation from Sylvanus G. Morley of the Carnegie Institution of Washington to J. Alden Mason. In 1930 Mason, then curator of the American Section of the University Museum, visited Piedras Negras to ascertain the feasibility of conducting excavations and removing several of the well-preserved monuments from the site. Mason secured a concession for work at the site by the University Museum from the Guatemalan government. Included in the agreement were stipulations that the Guatemalans would build a road to the site and that a paid position would be provided for a Guatemalan inspector during each excavation season. Artifacts and monuments removed from the site were to be shared by the Guatemalans and by the University Museum, which would have loan privileges. Mason directed the project from 1931-1932, followed by Linton Satterthwaite, Jr., who directed research through its conclusion in 1939. Typical for the times, the project concentrated its excavation efforts on the monumental architecture of the site by documenting building sequences. The results of the University Museum's excavations at Piedras Negras, together with work by the archaeologists of the Carnegie Institution of Washington at Chichén Itzá in northern Yucatan and Uaxactún in the central Petén region of Guatemala, played an important role in the development of modern archaeology in the Maya area. In 1931 work began on the road from the site to Corregidora Ortiz, a distance of about 20 km, to permit transport of the large stelae. The University Museum of the University of Pennsylvania began work at Piedras Negras in 1931 on what was initially planned as a two year program centered on removing and preserving 16 of the famous sculptured monuments. Eight monuments eventually went to the Museo Nacional in Guatemala City (segments of Altar 4, Lintel 4, Miscellaneous Sculptured Stones 13 and 19, and Stelae 6, 15, 33, and 36) and eight went to the University of Pennsylvania Museum in Philadelphia on extended loan (segments of Altar 4, Lintels 1, 10 and 12, Miscellaneous Sculptured Stone 1, Stela 12-14 and 40, and Throne 1). Most of the monuments were returned to Guatemala in January of 1947. Only Stela 14 and one leg from Altar 4 remained in Philadelphia. The impressive results from small scale excavations the first two seasons led to six more seasons of field work (1933-1939). Funding for the project initially came from a private benefactor, Eldridge R. Johnson, founder and president of the Victor Talking Machine Company, and a member of the Board of Managers of the University Museum. Subsequent financing came from additional private sources and the American Philosophical Society. Inadequate funds led to one season (1934) during which excavations could not be undertaken because support was not available for the Guatemalan inspector's salary, an entirely skipped season (1938), and the inability to publish major monographs on the site. The major accomplishments of the project included the careful mapping of the core area of Piedras Negras and a considerable amount of the surrounding house mound area resulting in the preparation of an excellent site plan by Tatiana Proskouriakoff. Numerous structures were excavated and architectural documentation was provided at a then unprecedented standard. The isometric reconstruction drawings of the architecture, many by Proskouriakoff, continue to provide a visual impression of the major structures at the site. Several new stelae and wall panels (lintels) were recovered and carvings removed for museum display and storage in Guatemala City and Philadelphia. Other innovative methods used at the site included test-pitting, probing in more modest structures, and the detection of new building types, such as the monumental sweat baths that cluster near Piedras Negras plazas and courtyards. The work of the University of Pennsylvania Museum at Piedras Negras is known from a variety published articles, preliminary reports, and an unfinished series of topical reports. Although Mason was the overall director of the project and field director during the first two years, Satterthwaite carried out most of the excavations, served as field director (1933-1939), and ultimately wrote most of the resulting articles and topical reports issued irregularly between 1943 and 1954. A complete site report by Mason or Satterthwaite was never published in part because of the economic impact of the Great Depression on publication budgets. Nevertheless, five fascicles comprising the Piedras Negras Preliminary Papers were issued in a very limited distribution between 1933 and 1936. These were followed by five more fascicles of Piedras Negras Archaeology: Architecture, a series published between 1943 and 1954. Both sets are today almost impossible to obtain. Piedras Negras Archaeology, 1931-1939 represents the republication of both the Piedras Negras Papers and Piedras Negras Archaeology: Architecture, as well as the first publication of several essays by Frank Cresson and Linton Satterthwaite. This volume is also a part of a broader effort to make the results of the University of Pennsylvania's Piedras Negras research available once again to the scholarly community. In addition to Piedras Negras Archaeology, 1931-1939, William R. Coe's 1959 (reissued on CD-ROM in 2005) report on the artifacts from Piedras Negras, the last major report published on the University Museum's excavations, was recently made available on CD-ROM. Copies of these and other University of Pennsylvania Museum publications are available for purchase at http://www.penn.museum/about-publications.html. The following PDF files require Adobe Acrobat Reader. To download the latest version, click this link.